The Burton Cracking ProcessFrom The Calumet Region c1959, “The rapid growth of the automobile industry and the general increase in the use of gasoline engines for other purposes ushered in a new era for Whiting. 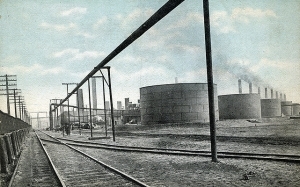 In 1909 Dr. William M. Burton, at the time general manager of manufacturing for Standard of Indiana, instructed Dr. Robert E. Humphreys, chief chemist in charge of the Whiting laboratory, to go to work on the problem of increasing the yield of gasoline from crude oil.” Humphreys knew that the application of high temperatures would “crack” molecules and experimented with this process. After many failed attempts, he tried to use heat and pressure together on the oil. “When this was done, any oil as light as gas oil would distill off when a certain temperature was reached, and there would be no cracking. 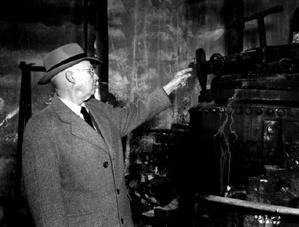 If the gas oil could be held in a still by the use of pressure until a cracking temperature was reached, Humphreys thought it might provide a good yield of gasoline.” Humphrey’s was right and the thermal cracking process was invented. The Burton Distillation Unit is considered one of the great inventions of modern times. The still now resides in the Smithsonian Institute. On Saturday morning August 27, 1955, at 6:15 a.m., without warning, several explosions tore apart Fluid Hydroformer Unit 700. According to an article that appeared in Industrial Fire World, “No single error or breakdown destroyed FHU-700. Rather, as in most industrial accidents, it was a specific sequence of events, one after another, that lead inexorably to the final outcome.” Debris rained down from the sky damaging several homes in the process, and then the fires began. Flames consumed the refinery’s storage tanks acre by acre for the next two days. 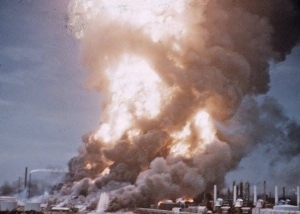 When the fire was finally put out on September 4, 1955, fifty nine tanks had been completely destroyed, along with 1 1/4 million barrels of crude and refined products, not to mention the damage to civilian homes and refinery structures. Although this inferno shook Whiting and the smoke could be seen as far as Chicago, the devastation only took the life of one individual. Three year-old Richard Plewniak was killed in his sleep as a 10-foot steel pipe torpedoed through the roof of his home. 600 homes were evacuated to avoid any further casualties. Frank A. Horbleck, Standard Oil Refinery Chief, had plenty of resources at his disposal. 300 of the refinery’s employees who were trained as firefighters, and another 300 who had enough training to work as back up firefighters, were assisted by firemen from neighboring cities including: Whiting, Hammond, East Chicago and Chicago. The Standard Oil fire brigade was comprised of eleven fire marshals, seven fire trucks, 44 hose carts and 80,000 feet of fire hose 2 1/2 inches thick. As the days went by, the firefighters realized their there task was to contain rather than extinguish this fire bomb, and they began to create sand barricades around the refinery. When the fire was finally squelched eight days later, the inferno left a $30 million debt, declaring it a National Disaster, requiring the National Guard to assist with the chaos. A year later it was business as usual at Standard Oil, rebuilding wherever necessary and operating near 100 percent crude capacity.